VT220 Terminal Emulation • ZOC: Modern VT220 terminal emulator for Windows and macOS . ZOC Terminal is a professional VT220 terminal emulator offering an industrial strength implementation of the VT220-emulation, which lets you access a variety of servers (OpenVMS, Linux, etc.) via telnet, secure shell (SSL/SSH) or serial connections. Overview: Servers are central computers that can be located anywhere in the world. To use or maintain them, they need to be accessed through so-called dumb terminals or thin clients or PCs running a terminal emulation, e.g. VT220 or xterm. The VT220 terminals originate in past when DEC was a major manufacturer of mainframe computers running the VMS operating system. VT220 terminals were used to access these servers. Nowadays terminals are emulated (simulated) by software, hence software that takes the function of those VT220 terminals is now called a VT220 emulator. 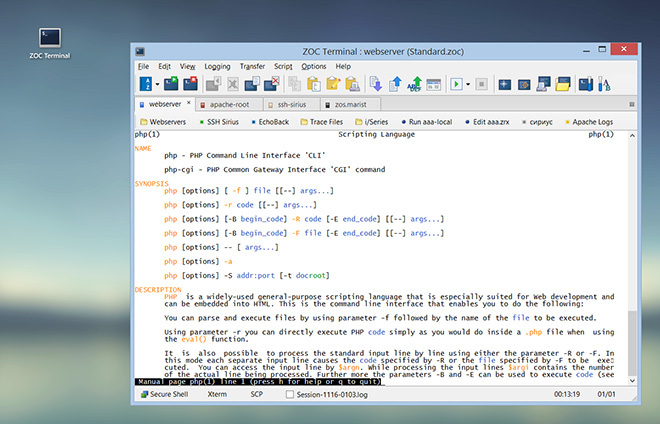 Such software (like ZOC Terminal) is available to access server operating systems like OpenVMS, Linux and others. In computing, a DEC VT220 is a reliable all purpose terminal type for access to a variety of computer systems. The VT220 (Video-Terminal 220) was originally developed by DEC, a former competitor of IBM and maker of computer equipment and mainframe computers. The VT220 was originally sold as a physical stand-alone terminal for the VAX mainframes running the VMS operating system. In the past (before the PC), a terminal was to be a device consisting of a physical screen and keyboard. The terminal was connected to a central server and provided a user with the means to enter data into the server and see results that the server sent back to the user's screen. Thus the users had (rather inexpensive) terminals on their desk to provide them with shared access to a (prohibitively expensive) central computer. However, with inexpensive PCs being available anywhere, the use of a single purpose screen and keyboard to access a server has become an outdated concept. Instead, these days a program on a PC can, emulate (simulate) the functions of a VT220 terminal. A software that does this, is called a terminal emulator. Such software is still in demand though, because the server software once running on mainframes is now running on affordable machines (e.g. OpenVMS or Linux). The mark of a good emulation, besides adding features to the original terminals, is to inpret the data stream in exactly the same way as the original terminal did (there is even a software dedicated to testing this for VT terminal emulators). As all terminal types, VT220 is a standard that allows the server to send text to the user's screen. By embedding special controls in the text, rather than just displaying text from left to right and top to bottom, these codes also allow control over the placement and display charachacteristics (location, color, etc.) of the text. E.g. in order to send the text "this is an error!" to the user's screen with the word "error" highlighted, the host would send This is an ^[1merror^[0m! to the VT220 terminal. Rather than displaying all the text, the VT220 terminal will interpret ^[1m and ^[0m as commands that tell it to highlight the text that is received between them. The VT220 emulation extended the possibilities of earlier terminal definitions like DEC VT100 or VT100 to allow the server to control special characteristics that go beyond the requirements of initial vt100 terminals, e.g. to support additional keys (like F5 - F12 function keys) that were not available on the VT100/VT102 series terminals. Another improvement in the VT220 terminals was the availability of country specific character sets and thus the ability to render text in European languages correctly (e.g. the German word "über"). Today most 'terminals' are simply a software running on a PC. But many standard telnet clients can be used to emulate VT220 terminals in a basic way, but lack support for certain subtleties in the way true VT220 terminals handled the incoming data. Essentially, the basics of VT220 are easy to implement, which is why it is supported in most terminal software to some extent, but the subtleties are hard to get right. ZOC however has a long history of VT220 emulation and correctly implements VT220 details, that are rather arcane. Thus it lets you access servers via a telnet or SSL/SSH connection using a top notch VT220 emulation. Additionally ZOC supports a wide scale of other emulations used in the Unix world, like Linux, xterm, Wyse, QNX, TN3270, TN5250 etc. The ZOC telnet/SSH client also includes a number of other useful features. It comes with a modern multi-tabbed user interface and is highly configurable. Beyond that it includes the usual terminal features such as keyboard redefinition and scroll back buffer. It also has some very advanced and unique features such as a powerful script language and automatic triggering of actions based on received or typed text. This terminal emulation software also supports vt102, VT220 and several types of ansi as well as Wyse, TVI, and Sun's CDE. ZOC also features major file transfer protocols like X-, Y- and Zmodem as well as Kermit and others. All these are offered in solid implementations that leave nothing to be desired.